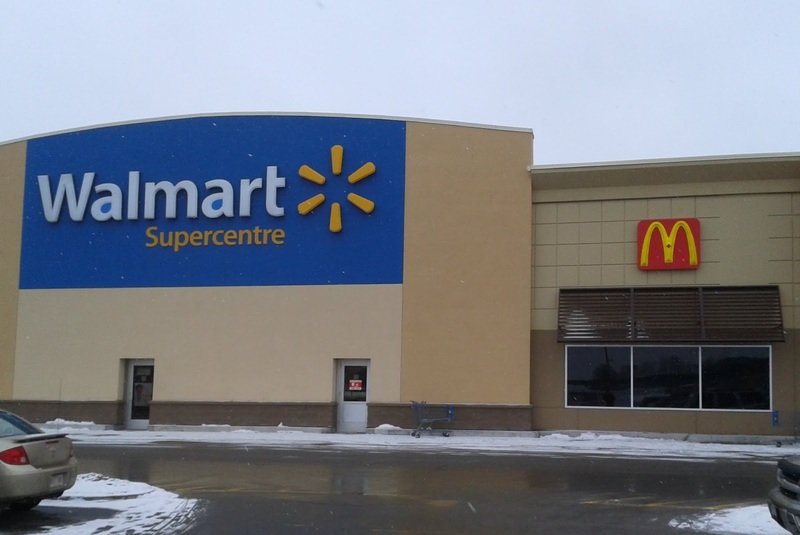 After a bad visit to McDonald's (450 Terminal Avenue, Ottawa) at Wal-Mart in the Ottawa Train Yards I completed the "Tell Us How We Did Today" online survey about my previous visit. I also made sure to include the link to my previous post in the comments and requested an e-mail response for a follow up. a) He noted in his e-mail that he was disappointed that I received service and atmosphere below standards on multiple occasions. b) Noted he is personally investigating the discrepancy in price difference across the computer systems in the market to see what is causing it. As well, Mike offered to mail some coupons to me if I provided an address. I followed up on this e-mail that day with my address an contact information. I waited until January 11th for either an e-mail response from the Assistant Manager or coupons to arrive in the mail. Nothing arrived from the Assistant Manager in the mail or via e-mail. Curiously though as I waited for Mike to come through with the promised coupons, I received an e-mail on January 6th from a "Jeff" with a "@altemar.ca" e-mail address. I Googled "altemar.ca" and came up empty as a web address or anything related to McDonald's. Jeff's e-mail though was standard corporate apology baffle gab stating "it was with deep regret that I received your complaint..." All in one noticeably copied and pasted paragraph signing off with the store's franchise # of 40213). But interestingly enough, on this same e-mail, Jeff CC's the 40213 McDonald's franchise e-mail address. So the question comes down to who is "Jeff" a local area privately contracted management type by McDonald's with a "atlemar.ca" web address? Why is CCing the franchise "40213" address? If Jeff believes McDonald's takes "tremendous pride in serving our customers the highest level of Customer Service each and every visit" then how come it took his franchise team almost a week to respond to the customer response? Sure I did receive a response from an Assistant Manager, but Mike doesn't appear to be from franchise 40213 associated with McDonald's at Wal-Mart Train Yards. To make matters worse "Jeff" also CC'd another franchise, 2818 and a "Holly". I Googled Holly's full name and came up with a media report of her handing out an Employee Scholarship to a Brockville McDonald's employee last summer. At least a local corporate type, "Holly" was now aware of the service and cleanliness issues at McDonald's Train Yards location. I replied back to "Jeff" and company also on January 6th pointing out I had received an e-mail from "Mike" and was awaiting the promised coupons and would be willing to return to the McDonald's Train Yards location once they were received. Back to Mike now on January 11th. I e-mailed Mike again, while CCing the franchise 2218, 40213, "Holly" and "Jeff" inquiring if Mike had received my previous e-mail with the address to mail the coupons to or what the status of the coupons was. I also including mentioning CCing the others as I had received an e-mail from them as well apologizing for my experience and to keep them in the communications loop. Mike replied quickly the next day saying they had run our stamps and could not be purchased on New Years day, January 1st. He did note that they had been mailed and I should receive them soon. I received the coupons and a letter from Mike on January 14th. Curiously though Canada Post's post mark was dated January 13th. Apparently it takes McDonald's a while to purchase stamps and get things in the mail. Sure you cannot purchase stamps on January 1st as Canada Post and most stores are closed. Buy January 2nd and onwards post offices, Costco and other stamp retailers are open. Also of note on the envelope, the return address of 2269 Riverside Drive was not the McDonald's I visited. That is the address of the McDonald's I Googled Mike's number from. But at least he came through with promised coupons. The coupons I received included 1 free large sandwich value meal (i.e. a Big Mac, Medium Fries and Medium Soft drink) and a 10% off coupon for a visit to the 2269 Riverside Drive McDonald's. The letter was also interesting, it was not addressed to me. It started with "Dear Shayla...." Um, who is Shayla? Probably another customer who filled out the online survey with a bad experience at some McDonald's in the Ottawa area. I guess whoever got the task of inserting the letters into envelopes and handwriting the addresses does not have the attention to detail to ensure the right letter goes to the right place. I filed the coupons away for use later that week with hopes of using the coupon to see if Mike and Jeff's promises of improvements at Wal-Mart Train Yards would turn out to be true. On January 15th I received two more envelopes in the mail from McDonald's. Both envelopes had a return address of 1795 St. Laurent Boulevard, which is the same address as a McDonald's Restaurant. In one envelope was a letter from a "Josephine", Restaurant Manager, with a colour letterhead from the McDonald's at Wal-Mart location I visited with my name and address in a professional formatted business letter. But a form letter apologizing for any inconvenience and thanking me for filling out their online survey. Josephine included in this envelope coupons for 2 free breakfast meal coupons (i.e. an egg mcmuffin, hashbrown and small coffee), 2 free McCafe Beverages and 2 Large sandwich value meals (i.e. Big Mac Meals). Interestingly, the letter was not hand signed like Mike's was. In the second envelope a letter from a "Josephine" was a generic "Dear Sir/Madam" photocopied apology letter from the 1795 St. Laurent Boulevard McDonald's location. Josephine's same last name and "Restaurant Manager" was on the bottom of that letter as well without a signature. In this envelope was 2 free meals (i.e. big mac meals) with an expiration date of December 2014 on them. McDonald's in Ottawa in terms of Customer Service has it about half right. After receiving the above e-mails and written correspondence from McDonald's representatives, here is what I believe should have happened. By all means send an e-mail in a timely manner referencing directly referencing the customer's experience and apologizing for it as well as offering to make amends by sending coupons. The letters should be on professional McDonald's letterhead in business format and hand signed by the manager. But make sure that e-mail comes from the management at the franchise location or McDonald's area or district supervisor and not an "Assistant Manager" from what optically looks like another McDonald's franchise. Also, do not send an additional apology e-mail from someone else (i.e. "Jeff") or an additional letter (nevermind 2 envelopes) with form letters. Last but not least, make sure the correct letter gets into the correct envelope, especially if you are going to hand write the address on the front of the envelope. With an avalanche of McDonald's coupons in hand, my wife and I decided Wednesday for dinner we would try McDonald's at Wal-mart in the Ottawa Train Yards should be put to the test to see if Mike, Jeff & Josephine's beliefs that, as Josephine notes in one of her letters, "McDonald's does its best to maintain high standards of quality, service and cleanliness and value to guarantee that each visit you make to our restaurant is a pleasant one. We arrived around 5 P.M. to the McDonald's location and only had to wait for one customer in front of us to order. There were two cash registers open with one regular employee and one supervisor taking orders. The supervisor disappeared to fill a couple of orders and the employee switched registers to take our order. We handed our coupons to the employee and attempted to order. The employee looked up, after reviewing the coupons,looked at us strangely with the look of "how in the hell do I ring this in?" and asked her supervisor. I do not fault the employee for not knowing these coupons as they are not the normal everyday coupons received in the mail. The Order: 1 McChicken Meal and 1 Big Mac Meal (both come with medium fries and medium fountain). The supervisor rang in the order and looked at me and said, "that will be $16.50". Before I could say anything she did a double take and said, sorry, that wouldn't be it, took the coupons off and got my free meal. We collected our tray and headed over to the relatively clean seating area. It appeared to be a slow night at the Wal-Mart McDonald's as there were only two other tables occupied. One McDonald's employee was mopping the floors and the tables looked at least to have had a wipe within the past couple of hours instead of that day. Our food was decent temperature and tasted like it was made to McDonald's corporate specifications. Things appeared to be looking up for this McDonald's. Josephine, Mike and Jeff's possibly may have intervened to review staffing, cleanliness and quality. Value? $16.50 for two McDonald's meals at regular price is a little atrocious. $14 and change perhaps, but quite frankly much above $14 is pushing it considering the portion sizes. I returned on Friday for lunch with another coupon for a free meal in hand. I arrived to be third in line with two cash registers open. After ordering with the same employee I had on Wednesday evening, things started to get interesting. The Order: 1 Big Mac Meal (Big Mac Sandwich, Medium Fries and Medium Drink). The employee, who was not wearing a name tag, tried her best to promo the items. I tried showing her my receipt from Wednesday's visit to see if it would help. No go, it was not working for her. She called her supervisor, Roni, over who was filling orders. He rang it in and left to fill orders again. The employee got out a tray and paper tray liner and put it on the counter. I slid over to stand in front and let the next order be taken from an older francophone gentlemen. I did note the absence of a receipt on my tray but didn't think much of it. The gentlemen behind me slid the other side and waited for his items. Roni started placing things on the tray in front of me. A Big Mac, drink cup, 1 large coffee, 1 small coffee, 2 cheeseburgers and more. I stepped back wondering where my order was. It looked like the francophone gentleman's order but his receipt and tray were on the other side of the cash. Roni eventually called out the order again and nobody moved. There were only two of us waiting for our orders with zero customers in line. I looked at Roni and said neither of our orders is here. The Francophone gentlemen nodded and repeated his order and I followed with my order. Fortunately, the employee who had taken the orders had disappeared from view leaving poor Roni there to figure everything out. Roni went through the cash register screen to see what happened. Roni looked flabergasted and shook his head. I pointed out again that I used the coupon for a free meal and pointed it out on the counter. Roni didn't even flinch and gave me a Big Mac Sandwich, Large fries and medium drink. I was off to the races. Roni then handed the other customer his order which somehow included an extra large coffee. I looked for a clean table. The place was busy. But at least the full shopping carts were near the front of the location. The table I chose had some ketchup on it but I artfully arranged my meal so I could avoid it. I did notice a tall thin lady wearing McDonald's supervisor attire cleaning the condiment and drink section by hand. She had earlier been helping behind the counter as well. Not sure who she was as there was no name tag on her either. The food though was made to corporate standards in terms of taste and was at least moderately warm. Overall, management for McDonald's at Ottawa Train Yards location can promise in writing both in e-mail and form letters that "McDonald's does its best to maintain high standards of quality, service, cleanliness and value to guarantee that each visit you make to our restaurant is a pleasant one" all it wants. But in actuality it is just feel good corporate statements bordering on false advertising. Sure I had one dinner at their Train Yards restaurant that was satisfactory. But that was when they had three employees covering a slow night. Thus, it should be expected decent to good service would be received. But when the restaurant gets busy the wheels seem to fall off. I will give them this, at least these last two visits had enough staffing on hand to ensure the wait in line wasn't that long. But at least ensure the orders are correct and have someone on clean up of the restaurant tables on full time so customers don't have to pay $8.00 and change for a Big Mac Meal and then have to artfully dodge previous customer's grime on the tables that a simple wipe down would resolve. In the end, at least I have additional coupons to use for meals and drinks at McDonald's. Once these run out, I will probably consider looking at the nearby Wendy's Train Yards location as the Train Yards McDonald's doesn't seem to care for "high standards" yet.